Well…more like my blogging room since this is where the “magic” happens past midnight when I am falling asleep, writing blog posts before getting up for my “9-to-5.” LOL. Although I am not actively working on this room because in my last post about how to finish a DIY project, I took a vow to start on my garage (and I have! woot!). But in between my upcoming garage posts, I want to show you more of my house. The reason I haven’t done it sooner…..well, honestly, I didn’t feel there was much to show! Some of these blogger chicks have AH-MAY-ZING homes, and they out-trump mine by a million, so I haven’t been touting my home all over the ‘net. I’m going to be proud of what I have done in this house, and I’m going to show it off to the world! Because, chances are, you’re doing your best to pull your house together, too (AND on a budget!). So, hopefully my pics and projects can be inspiration to you, as well! But that dreadful wallpaper….Thankfully it wasn’t patterned much, but still–WALLPAPER, you guys! ICK!! Not only that, it was–GASP!–vinyl! 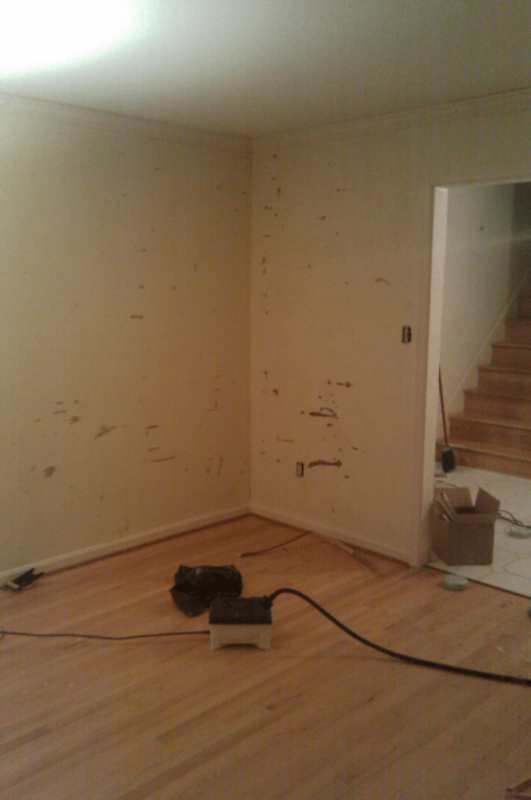 And the crazy part was that every part of this house was covered in wallpaper. I’ll be showing you more pics of that in other posts….don’t worry ;). Removing the wallpaper left gouges in the wall where the brown paper bag part of the wall became exposed. Not only that, the wallpaper left the stickiest glue that required us to use hot steam to go over the walls twice more just to remove the stickiness. Yikes!! It was a harrowing job. My family and I were staying at my mother-in-law’s while hubby and I got the house “ready” for move in. Funny, because it was never “ready.” Crap, even NOW it’s not “ready”! And it’s three years later! LOL. 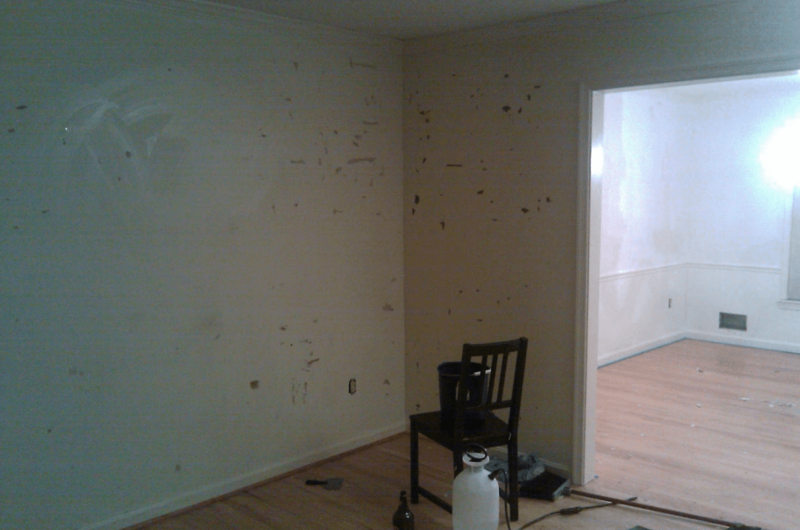 But you know what I mean….So anyhow, hubby and I would work on the wallpaper removal from 9 p.m. until 3 a.m…..Crazy times, yo. You should go back through my earlier archives and see where this whole house and blog started from. You wouldn’t believe it! So, moving on with the story….. 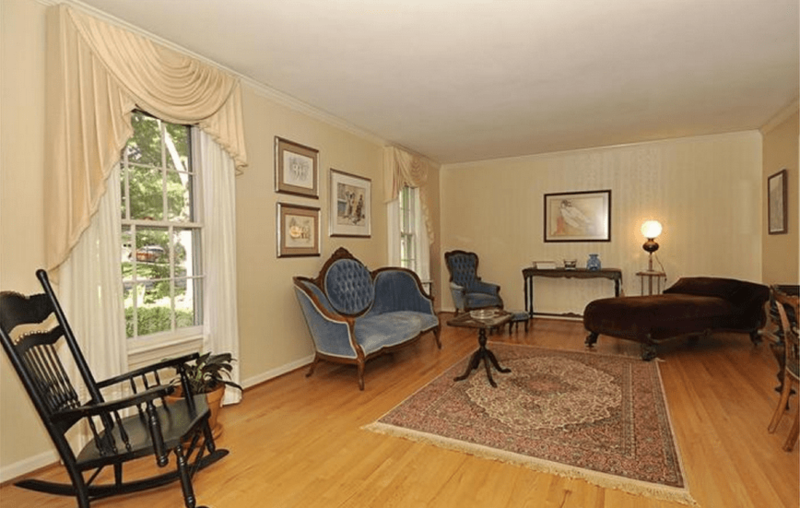 I don’t know what I was thinking about painting this room NEUTRAL beige. I have come to absolutely HATE this color of beige! LOL. It made the walls look dingy. 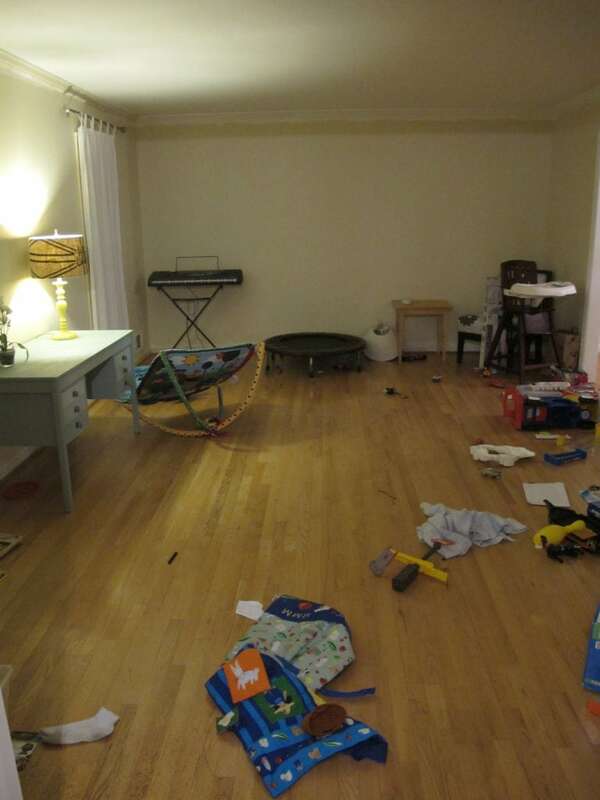 And, all the crap and toys surely didn’t lend to the “I love this room!” feeling. 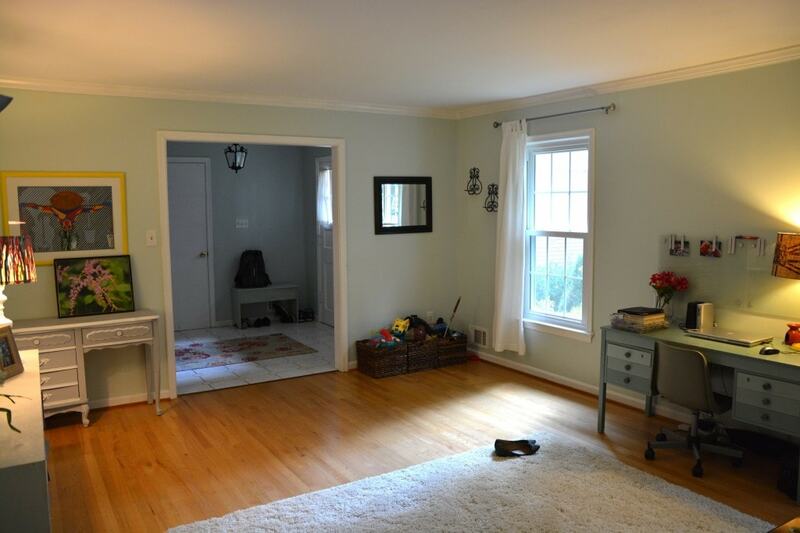 I’m almost embarrassed to show you THESE “in between” pics, because it’s horrible how we left the room while we tried to finish painting and to figure out what we were going to do with the room. 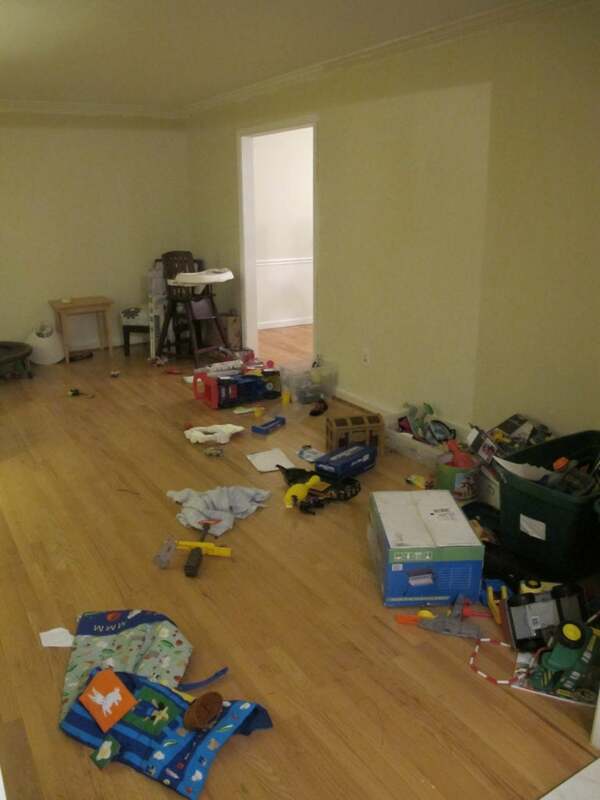 So it had become a junk room for the kids’ toys. Do you have any rooms like this?? You know, the ones that just house all your crap because you don’t know what else to do with it? Well, that’s how this room was! I almost forget it was ever like that…..
…because here’s what it looks like present day! 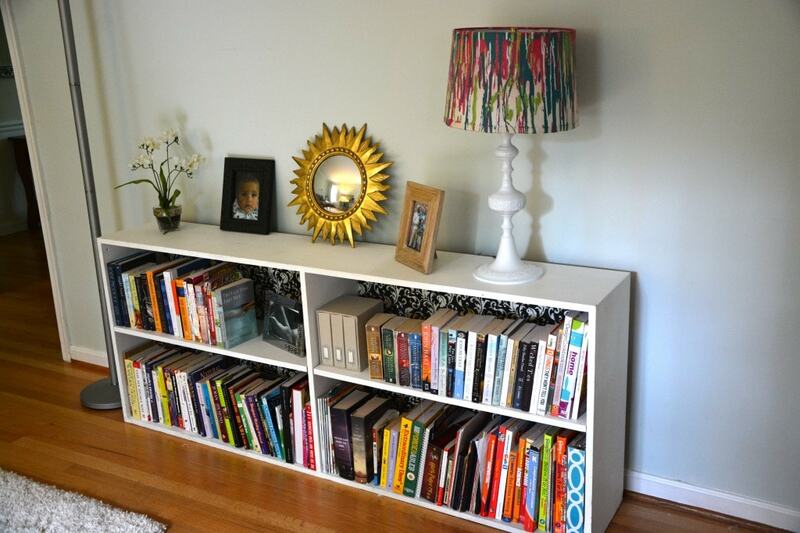 The cool thing is that nearly everything in this room is second-hand! 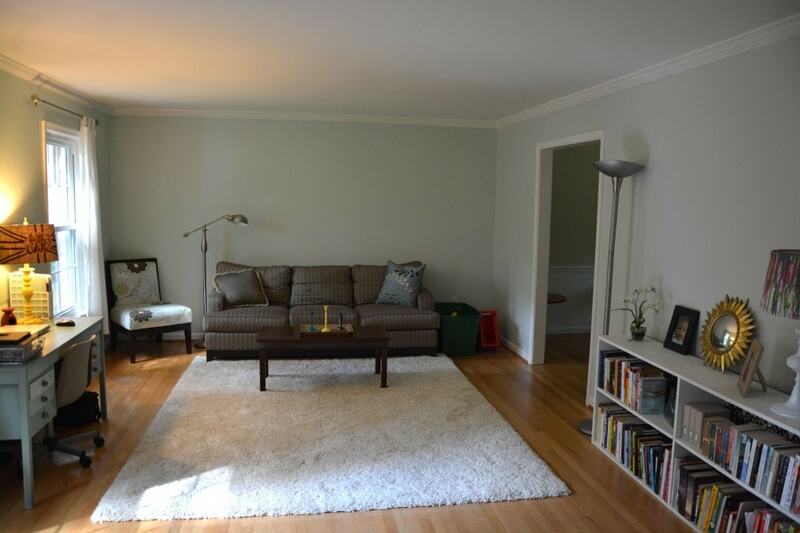 (except the rug, which came from Home Goods). 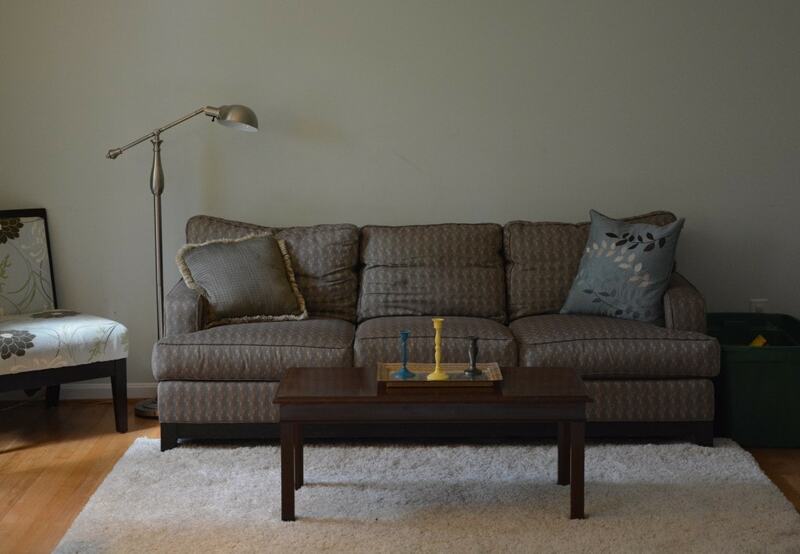 Paint color – Sherwin Williams Window Pane, which is actually right up there in my “FAVES” along with Sherwin Williams Rainwashed and Sea Salt! Spray painted lamp shade – This lamp here is one of my favorites! I spray painted a $5.00 hooka from the thrift store and then spray painted the lamp shade and let the paint dribble down the side. I love it! COST = $5.00 lamp base, $15 shade from Walmart. P.S. Nearly all those books were bought second-hand, too ;). 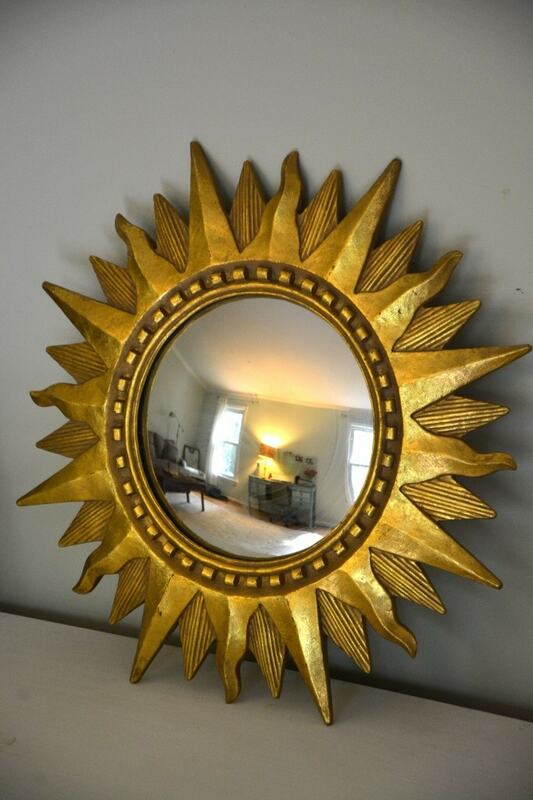 And this awesome sunburst mirror–yep, you guessed right–THRIFT STORE, for about $10-$15. I can’t remember exactly! But isn’t it amazing?! This reading lamp I scored at Home Goods with the rug for $60. It’s heavy and solid! Floral framed pic – I’m the photographer 🙂 I used Shutterfly to enlarge it. Super cheap way to personalize walls, and show off your own photography skillz! I picked up the frame from the thrift store. COST = $15 to enlarge, $2.00 frame. Here is a close-up of the framed DIY photography I shot. 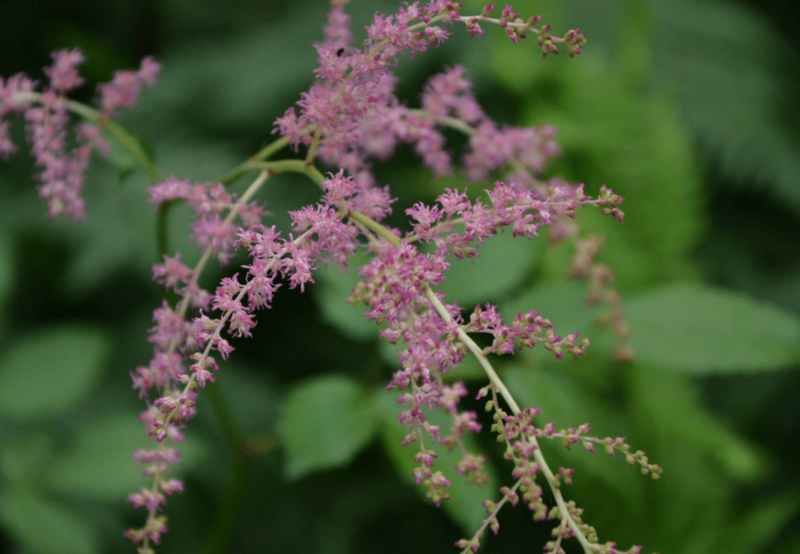 Not sure what type of plant, but it was so pretty! I love the lavender and green together! 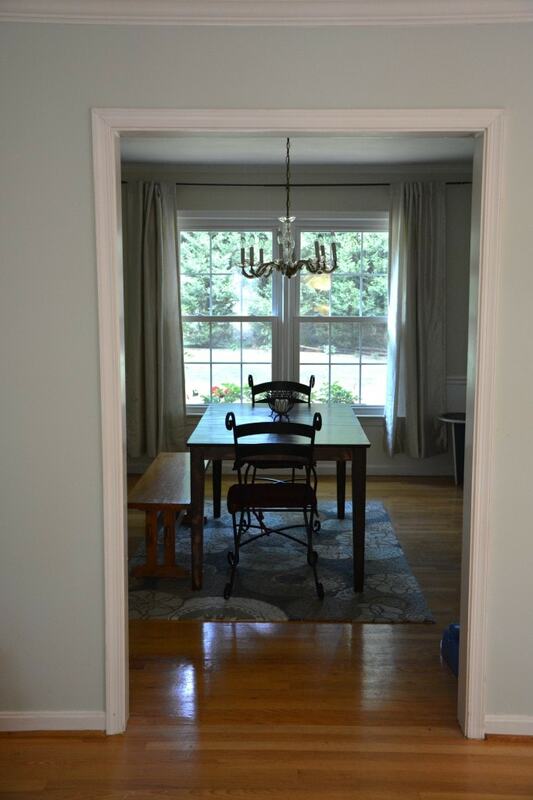 View from the reading/blogging room into my dining room, which has my $12.00 dining room table that I refinished, from the thrift store! WOOT! Love that table. Still need to find 4 chairs, and to refinish that bench, which ALSO came from the thrift store, $15. 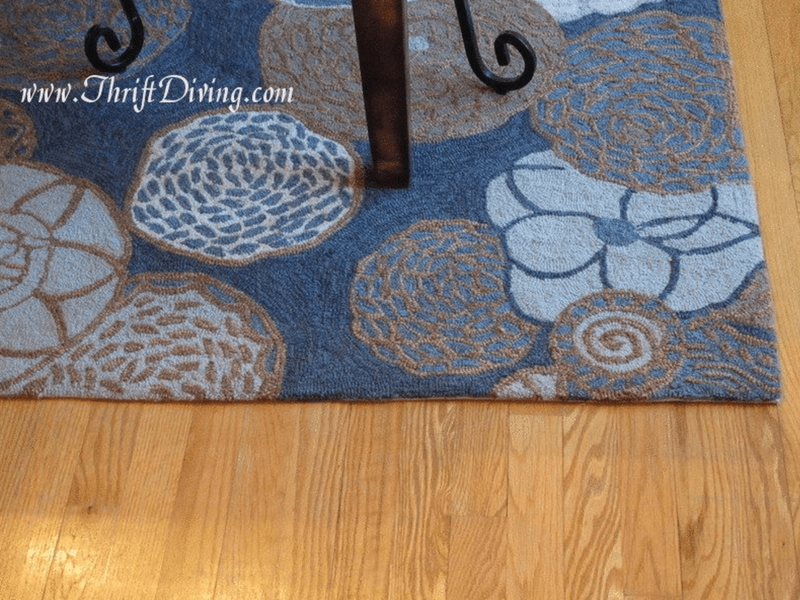 This rug came from Home Goods, about $150 for a 5’x7′. UGH…..there are no words for this picture. HA!!!! Just laughs….and, oh, yeah, EMBARRASSMENT! 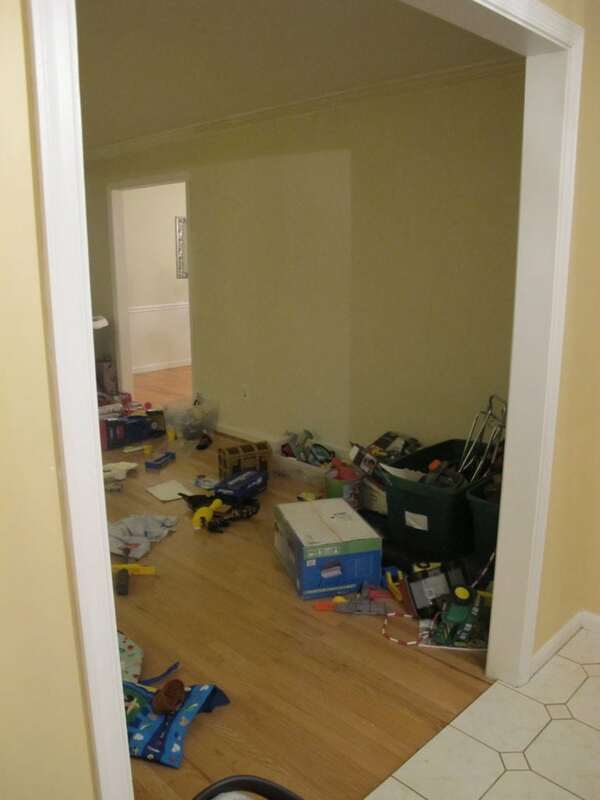 But don’t act like you don’t have SOME area in your house that looks like this while it’s in transition!! 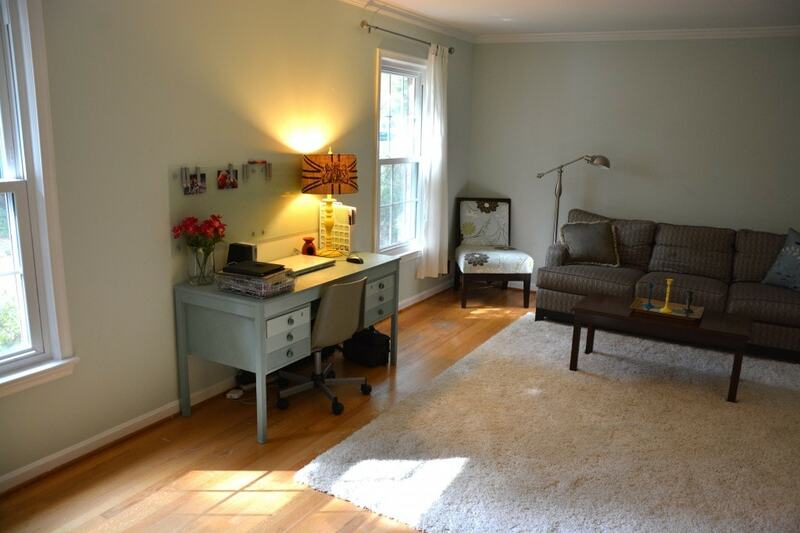 But sometimes the “AFTER” is worth the wait….And considering that I’m still not done in this room (need to hang pics, and I am thinking of doing some decorative molding), it doesn’t even matter. This is a big, pretty improvement! It’s getting there….slowly but surely….